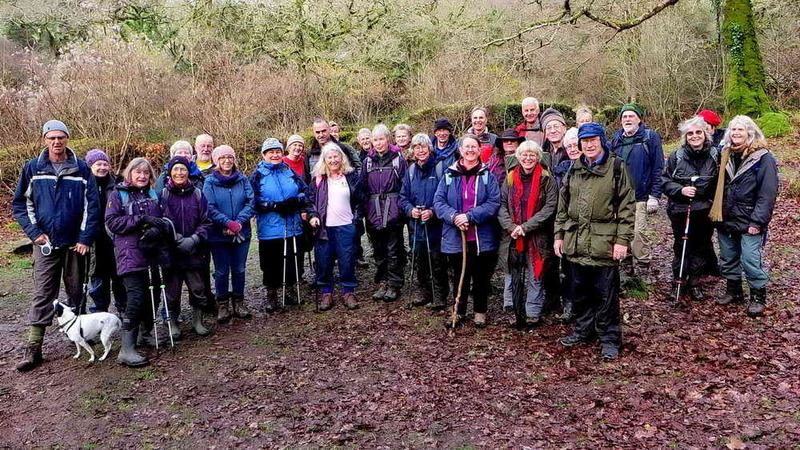 On Friday 25th January, 31 aficionados of the Short Walks programme met at Shaugh Bridge car park. The weather was grey and dull – but towards the end of the walk the sun shone on the righteous. 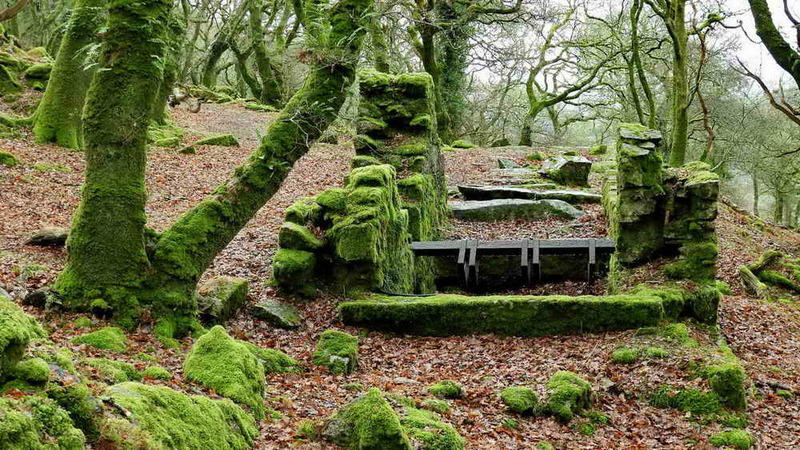 We set out to see remnants of four C19th industries – china clay, iron mining, brick works and granite quarrying. 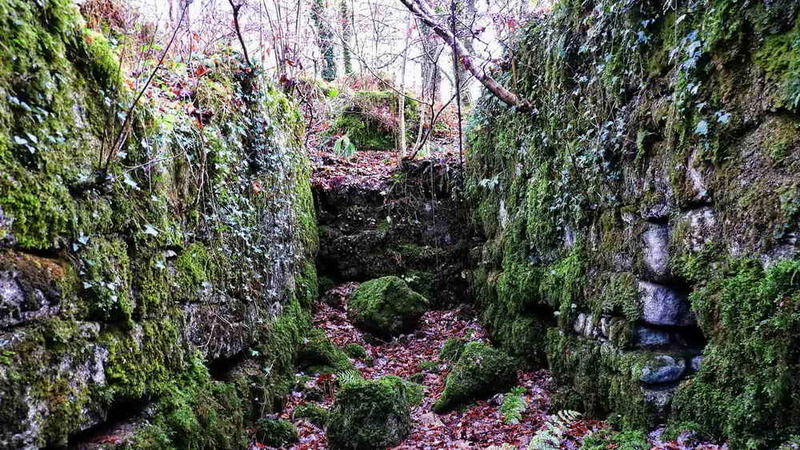 There seem to be seven recognisable quarries with the remains of a tramway system connecting them, including a well-preserved inclined plane. The clay drying works are believed to have been built in three stages from 1860 to 1895. Clay was brought here by a 2-mile pipeline from Cadover Bridge in the form of a slurry. It was stored in settling and thickening tanks up behind the building and dried on the floor above the furnaces. It was eventually cut into blocks and loaded into carts backed into the bays shown in the photograph above before being pulled by horse to a nearby railway station – Shaugh Platform, Bickleigh or both? There is a lot to see up behind this building. The white “v” marker indicates the position of a date stone seen in the next photograph. 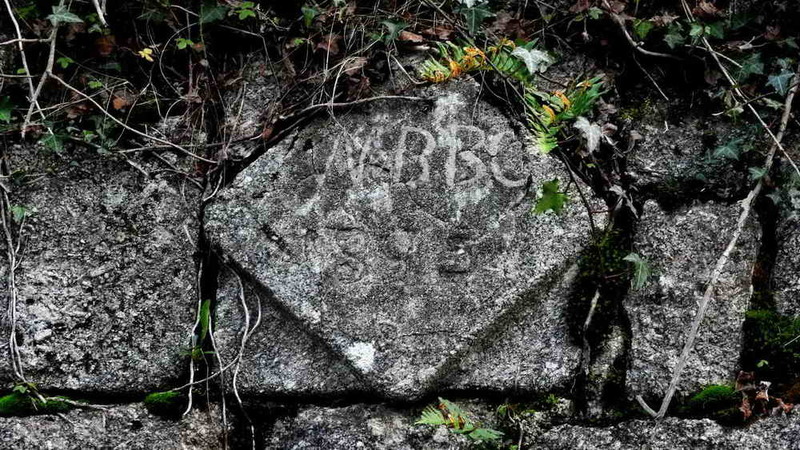 The date stone is inscribed WBBC 1895: this signifies Watts, Blake, Bearne & Company – a famous name that became dominant in the china clay industry. Today, Watts Blake Bearne Minerals is a company that is owned by the Belgian conglomerate, Sibelco, whose lorries are seen at the nearby clay pits of Shaugh Moor, Wotter and Lee Moor. On the path to the woods, we passed some discarded china clay in a bank, still white and difficult to get off boots! 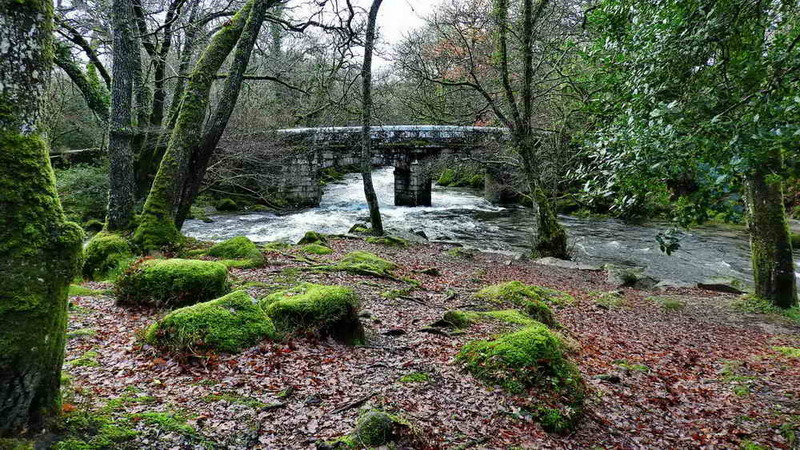 After leaving the car park and entering the wood, we crossed the wooden footbridge over the Plym (replaced in Nov. 2010) and saw Shaugh Bridge and the confluence where the Meavy flows into the River Plym. Shaugh Bridge was rebuilt in 1825 after a flood washed its predecessor away in 1823. 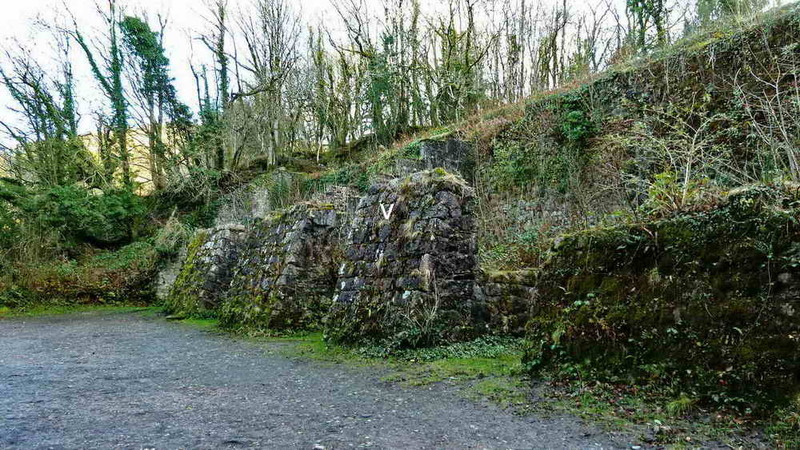 Ruins of the Smithy at the iron mine. 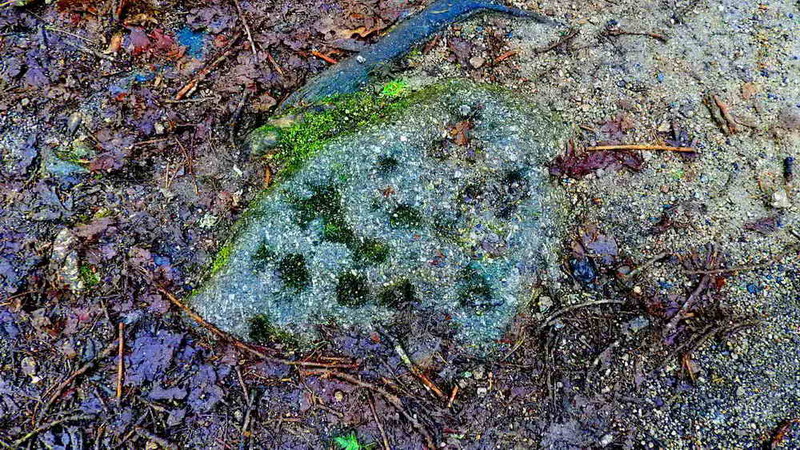 The drill-testing stone can be seen by the tree root, near the camera. 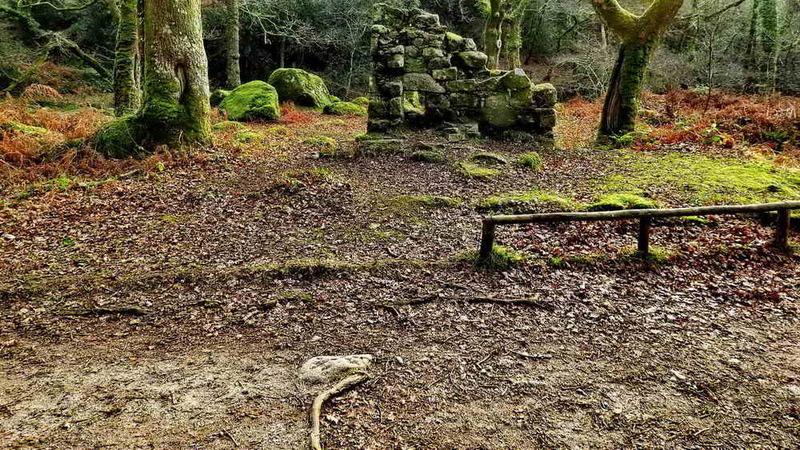 The drill-testing stone can be seen in the track, by the tree root near the camera, right beside the ruins of the old Smithy of the Dewerstone Iron Mine. Just before this feature, we passed a collapsed adit from the mine, on the left of the track. A short distance from here, up over the bank behind the camera, is a filled-in mine shaft. 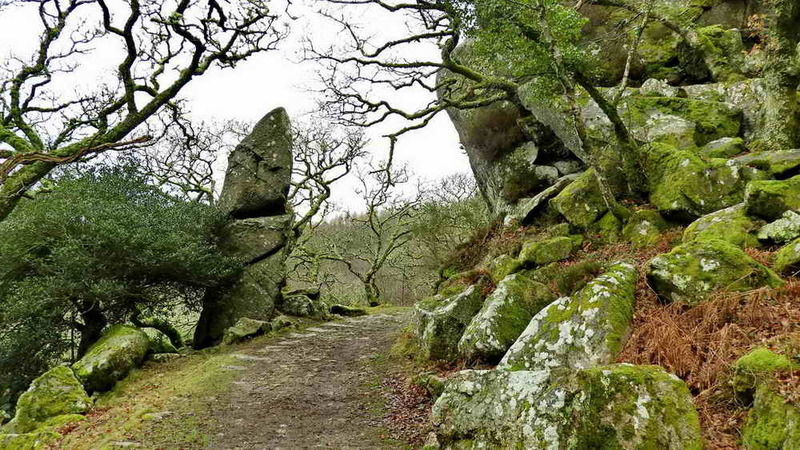 An interesting item that was found when researching this walk was another drill-testing stone – similar to those we have seen at Norsworthy Bridge and another near Windy Post on these walks. This is a stone that is said to have been used by a blacksmith to test the sharpness of chisels or “jumpers” – the latter were crowbars with a heavy weight halfway along their length. The tools were used for drilling holes in granite prior to inserting a pair of feathers and a tare that were then used to split the stone. After climbing the rough-paved track from the iron mine, we saw one end of the tramway and passed The Pixie or Pixie Rock aka the Puckie Stone. 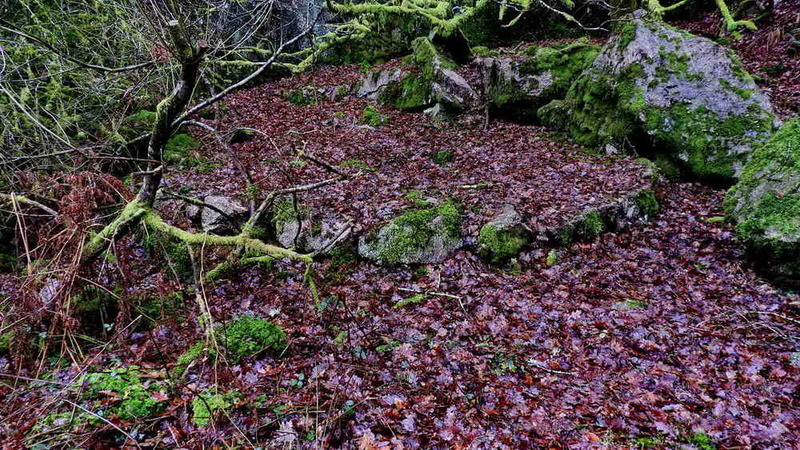 This is on a bend in the track where granite setts are still visible. There are two small quarries here, before and beyond the bend. Further along the track are two further small quarries. A few paces before this view above, when Pixie Rock comes into view, and two paces before a flat-faced rock on the right where the top slopes into the track, is an iron nail fixed into a sett, roughly in the centre of the track. We walked along the lower quarry track until we met the inclined plane. This is a dramatic feature, 400 yards (365 metres) in length and climbing 200 feet, with a gradient of 1 in 6. Granite setts that carried the rail tracks can be seen, especially at the top end. Wagons, loaded with stone, were lowered down this by cable with another wagon coming up as a counterweight. There is a passing place at the halfway stage. The process was controlled by a winding house at the top where the cables passed around a large drum. From the back of the winding house one can see that the incline disappears straight ahead, down to the lower level track. At this high level, the track goes away to the quarries diagonally to the left. There is a small (5th) quarry to the left of this view. The quarry above was the 6th that we saw, and the most impressive. The 3rd, 6th and 7th quarries each contained a base for a davit crane for lifting stone, presumably, onto the railway wagons. This suggests that track was laid into these quarries to load the wagons. The crane bases are not very obvious constructions and they can be over-looked. 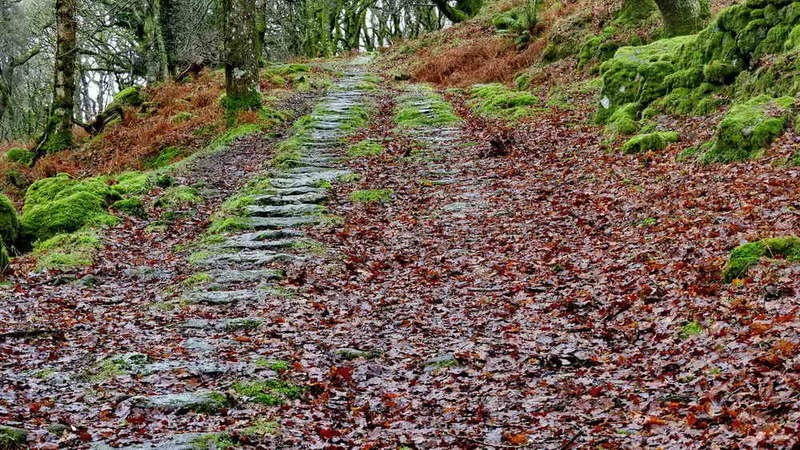 We descended the inclined plane and followed the track towards Goodameavy, reaching Dewerstone Cottage. This was originally the counting house, stables and smithy for the quarries and its extensive horse-drawn railway. 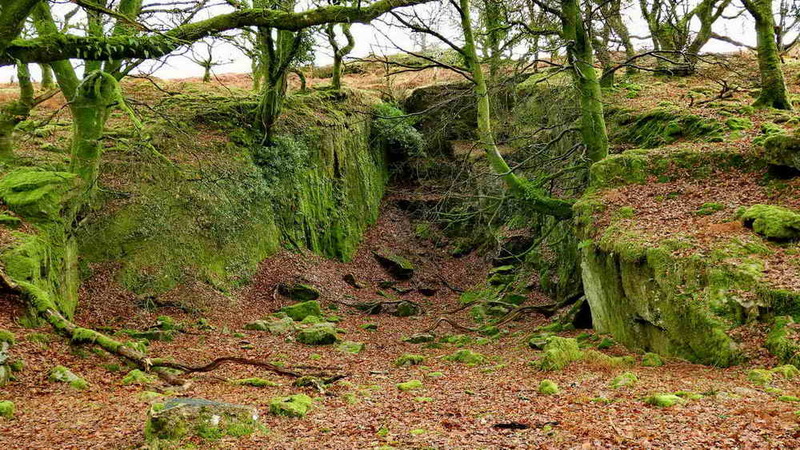 Quarrying on Dartmoor started around 1800, prior to which, surface stone was used for building. The quarries here are thought to have started around 1850 – they never became very big – and they closed when the company became bankrupt in 1865. 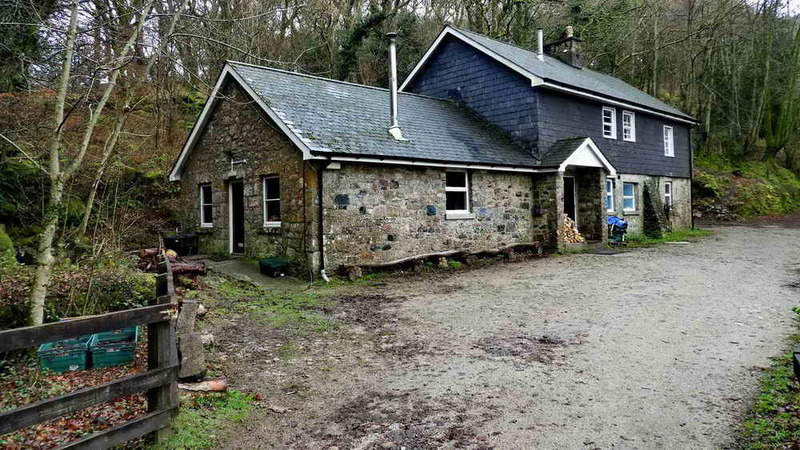 Earlier, in 1859, the GWR-South Devon & Tavistock Railway opened on the other side of the Meavy and in 1863, the Johnson brothers, who leased the quarries, started building a railway to link with it, starting near Dewerstone Cottage (as it now is). 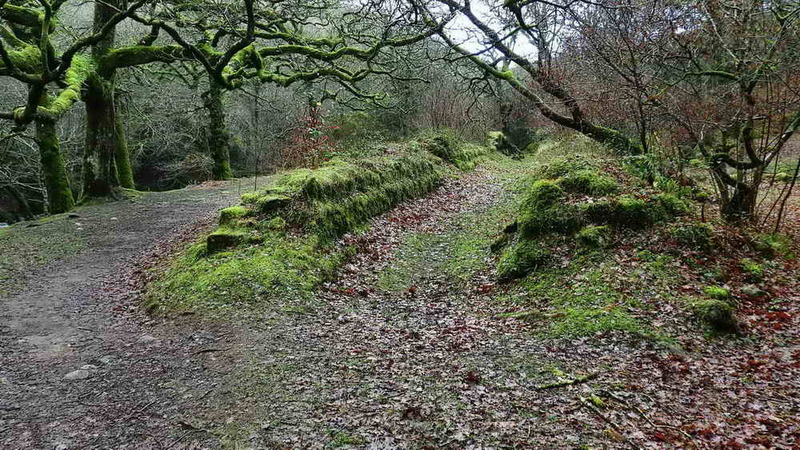 Unfortunately, Sir Massey Lopes, the landowner, refused permission to build a bridge over the Meavy, resulting in the quarries becoming uneconomic. They closed in 1865. There is an extension to this walk by descending to the riverbank and walking upstream until reaching a tunnel through the railway embankment where it reaches the river. The return to the cottage can be made by following the Goodameavy “road” back, passing through a cutting for the railway. 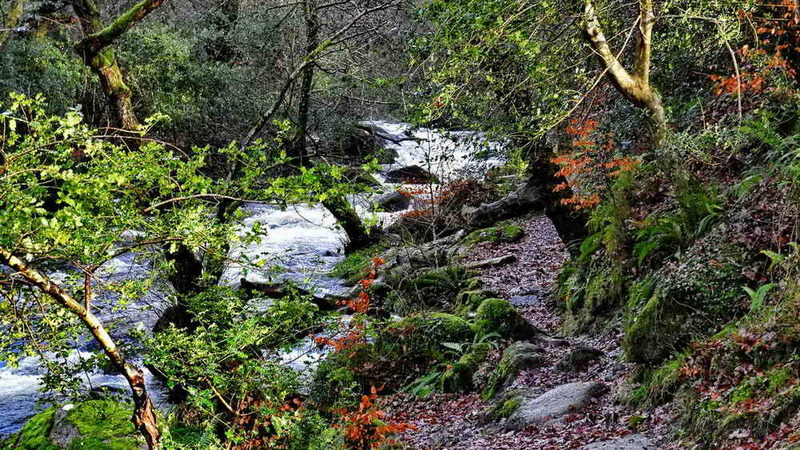 The walk continued by descending to the riverbank and following the path downstream towards Shaugh Bridge. 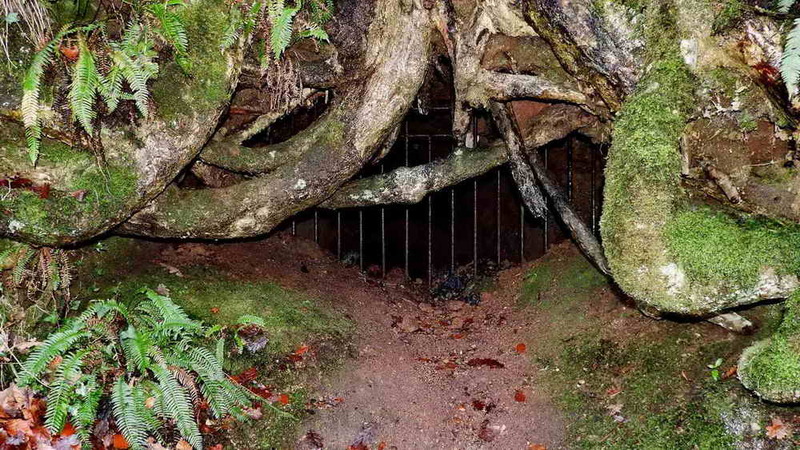 The path alongside the Meavy is rather featureless when it comes to items to describe, but it is a 500-metre long sojourn in a peaceful and picturesque environment, however, there is …..
An adit from the iron mine that was closed off by a substantial iron grille. While reconnoitring the walk, I met a family with young children and was told by one of the parents that they told their children it was a prison for errant youngsters! On approaching the brickworks, we saw the Brogden-Caspar tunnel kiln that was an innovation when it was installed in 1880. When the business was put up for sale in 1883, the inventory included “a Brogden and Casper’s improved tunnel kiln, two working sheds adjoining the brick kiln, nearly completed, tramways, eighteen iron tram wagons, two turntables, a 16 ft by 3 ft water wheel, tools, tramway metals, about 60 tons of iron ore, the manager’s office, and a smith’s shop”. This suggests that the kiln was still being developed. Close to the kiln, is the pit for the water-wheel that was part of the iron mine. This probably powered stamps for crushing the low-grade iron ore from the nearby mine; this was powdered and added into the mix for making bricks. The walk ended with a visit to the confluence where the River Meavy flows into the River Plym (see the first photograph above).